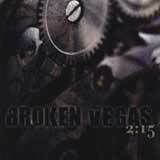 Broken Vegas is a rock/metal band based out of Chicago, with 2:15 being their 7 track, self financed debut album. The album features 3 studio tracks, and 4 live tracks. As per the band’s website, “Chicago’s new hard rock giants are representing the windy city with an introspective power fueled by psychedelic, metal, and grunge influences from days gone by yielding a unique crunching and melodic sound that is putting Chicagoland back on the nation’s rock map.” Instantly, the mention of grunge is a big turnoff to me. However, you can listen to the entire album on the band’s site to come to your own conclusion. The music is very guitar oriented, much like the approach Skid Row used on their Slave to the Grind album. However, there is definitely a more modern flavor to the sound that something like Slave to the Grind. Furthermore, the thick bass lines help to give the overall sound a moderate mid 90’s / slight grunge vibe. The chorus lines feature thick harmony vocals ala Skid Row, but sometimes they border on Alice in Chains territory (Without Today), which I’d rather see the band leave behind. The lead vocalist has a powerful and energetic voice, which helps to carry the melodies. Certainly, I count the lead vocals as a highlight of the album. He adds a lot of color to the songs with his charismatic vocals. I particularly enjoy songs such as Drowning Rose, 2:15, and Shadows on the Floor which feature crunchy, classic style guitar riffing as opposed to some of the groovier and more grunge leaning sounding tracks on the rest of the album (Without Today, Fire of Life). Still, I can’t knock the band on any technical aspect. They play their instruments very well, and there is some excellent guitar work to be heard here. As I said, the lead vocalist is perhaps the biggest asset of the band. After listening to this album, I hear tons of potential with Broken Vegas. However, I do feel like they are trying to cover too much ground musically. From grunge to 80’s rock, to heavy metal, Broken Vegas seems intent on covering it all. As a result, the music lacks a distinct direction and personality to my ears. Naturally, this will all come together for the band with time. With its energetic sound and technical proficiency, I can understand why this band is such a hit in their local club scene. In order to make it to the next level, I do think some fine tuning is needed. With the talent I hear behind the songs on 2:15, there no reason to think that the band can’t achieve future success if they put their mind to it. At any rate, I would encourage you to vist the band's website (link at the top of the review) and check this album our for yourself.